Now you can have your entire monthly schedule available at any time! The 2019 Note Calendar Template is a tool that helps you plan out your week and organizes your schedule in a way that is both easy to read and write! The simple template will give you the opportunity to write down all your general thoughts/plans and structure them into a detailed list that guides you through the week with ease. Don’t waste your money on expensive scheduling software. 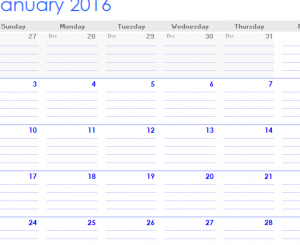 This template is absolutely free and easy to use, download the calendar today to get started! Start by download the free document to your computer. Simply click the link below to begin the downloading process. The template is pretty simple and straightforward once you open it. All the months are conveniently listed at the bottom of the page, just click on the month you want to start! All the days of the week are listed in the very top row. Just choose the box with the date you need to assign your post. When you have something to enter, simply click inside the box of the intended date and begin writing the details. The great part about this template is the ample amount of room you have to write your material. Also, the lines create nice even spaces between your writing, making it easier to read. When you are ready to move onto the next month, just click the navigation arrow at the top of your screen. You can also click the tabs at the bottom of your screen to select a different month. This document was designed for your convenience. Now plan your schedule in style, with the Note Calendar!